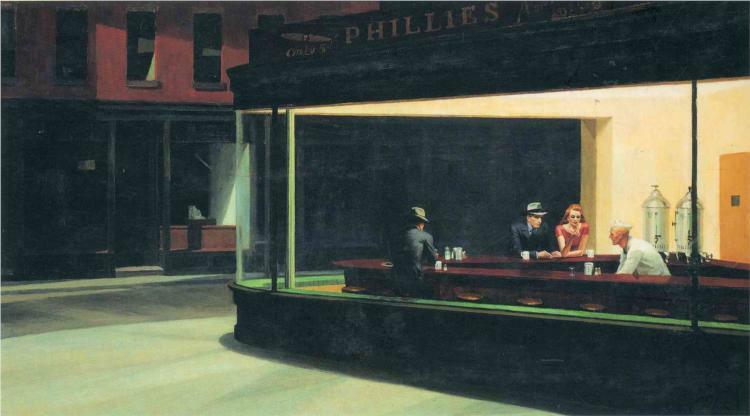 Nighthawks. Edward Hopper. Via Wiki Paintings. One of my favorite paintings! For me, there’s something to it that’s real life, but more so. And I can identify with all those people with no place to go in the wee hours. And Christy, you, too. Impeccable. YEARS ago….don’t really remember when but I was maybe early teens, I saw a poster of this in a store and immediately bought it. I had made myself a little “den” in my closet and I taped it to the wall and I would lie in there and stare at it…it seriously moves me in a way i still don’t fully understand. I have art in my home today that resonates with this piece. Maybe it’s time to dig deeper.